First a disclaimer. I’ve known the author of this book, Bill Nanson, for a few years now. For a long time, both of us have been active online, and Bill’s www.burgundy-report.com has set the standard for online reporting on a specific region. While I’ve given up the day job to work full time on wine communication, Bill remains outside the trade, which is—I think—quite a healthy place to be as it brings perspective. But he puts in the legwork. Based in Switzerland, he’s able to make frequent trips to the region, and usually works harvest there, too. So as a long-time follower of Bill, I cannot claim this review is entirely impartial, although I want to make it as fair and honest as I can. This book is the latest in the attractively presented series from the World of Fine Wine team, and they have to be congratulated for taking the considerable risk in not just opting for someone inside the trade, but rather backing Bill. This risk has paid off handsomely. He writes really well, and his introduction to Burgundy (the first 50 pages of the book), with important sections on vital topics such as actually enjoying the wines, is the best I have read. He also deals very well with the thorny issue of premature oxidation that has haunted white Burgundy over the last decade. It’s worth buying the book for this introduction alone. The bulk of the book is taken up by pen portraits of producers, some 90 of them. It’s a personal selection, including some famous names—but also leaving out some of the better known domaines to make room for producers who may be less well known but who are worth learning about. This is particularly useful because famous names are now usually so expensive. I like the fact that this book isn’t trying to replicate what has gone before. It’s not another Remington Norman/Charles Taylor spin-off. One of the distinguishing features of this Fine Wine Editions series is the photography of Jon Wyand, and once again he’s managed to capture many of the growers really effectively in his portrait work. It is truly remarkable how such a beautifully written and produced book, in full colour and on glossy paper, can have a list price of just £20, making it closer to £10 when bought from Amazon. Utter bargain. One criticism, and this isn’t Bill’s fault. The index is a bit bizarre, in that many of the Domaines are listed under ‘D’ for ‘Domaine X’. The index is also a bit on the short side. For example, there are no entries for oxidation or premature oxidation. It is a shame not to have commissioned a proper index for a book of this quality. It wasn’t so long ago that the wine trade was bemoaning the demise of the Faber and Faber series of wine guides, which later became the Mitchell Beazley Classic Wine Library. But now we have this growing range of Fine Wine Editions that’s filling the void, and the good news is that they are much better. 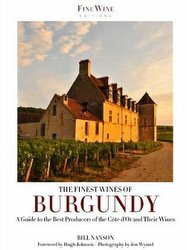 Even if you have a passing interest in Burgundy, buy Bill’s book!